SO - WHERE DO MY SCISSORS REALLY COME FROM? At HAIR EXPO we continued our push to make all scissor sellers accountable for what they claim about their scissors. finished in Australia - is it right that the scissor is be claimed to be made in Australia? 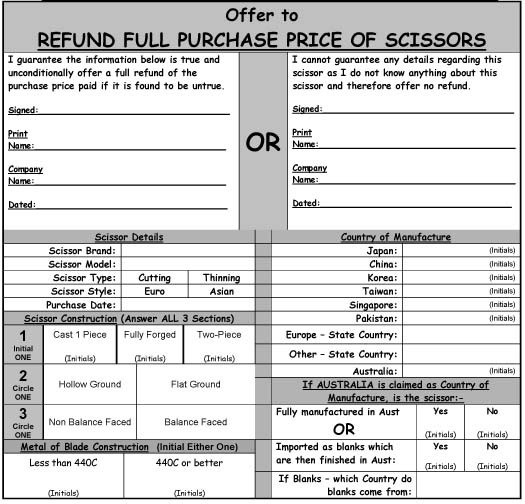 We were told by many customers that many scissor sellers had simply refused to sign the document below. One can only assume that they weren't comfortable in guaranteeing in writing, what had been said about the scissor at the time. As we were told, some of these who would not guarantee their statements included some companies who have been traditionally regarded as those who could be trusted to tell the truth about their scissors. We had numerous scissor companies confront us at our stand at Expo. It seems that our "SCISSOR GUARANTEE" document has ruffled a few feathers within the scissor sales sector of the industry. It appears there are more people bending the truth than we originally thought. That only serves to make us more resolved to make all scissor sellers accountable for what they claim. You can DOWNLOAD a copy of this document by "clicking here"
or call us on 1300 73 00 27 and we'll send you a copy. So......what was our original motivation for producing this form? There are many scissors that carry the word "JAPAN" on them that are quite simply NOT FROM JAPAN! Japan is just printed there to make you think that's where they come from. There are also a lot of "cast" scissors being sold as "two-piece" scissors and therefore the price is at least twice what it should be. We are aware of many scissor sellers that also tell hairdressers their scissors are two-piece or they are from Japan. Will they put it in writing? We're sure anyone who was telling the truth would be happy to! Being the largest in the world, we felt we had a responsibility to help stop hairdressers being ripped-off by heartless scissor sellers telling blatant lies about the scissors they sell & getting away with it. Rapid Edge is, by far, the world's largest scissor servicing organisation. Quite simply, Rapid Edge has over 250 outlets Worldwide and that makes us over 20 times the size of anyone in Australia. We have never felt the need to constantly "tell" anyone how good we are or how much more we know than anyone else - our work speaks for itself. We didn't get to be the biggest in the world by producing anything less than outstanding quality workmanship. We don't need to tell people how good we are - we just show them! Keep your eyes on this spot......we will continue announce initiatives to bring ALL scissor sellers to account for the things they claim regarding the scissors they sell.